This easy recipe for slow cooker honey chicken is a delicious combo of sweet and tangy flavors that is perfect for a hungry crowd! And one of the best things is the slow cooked, fix it and forget it part, because there’s nothing like walking in the door at the end of the day and realizing that dinner is already done! For the next few weeks this blog is going to bounce back and forth in between fun and fancy recipes for the holidays, and super duper easy meals you can make in between those holiday events. 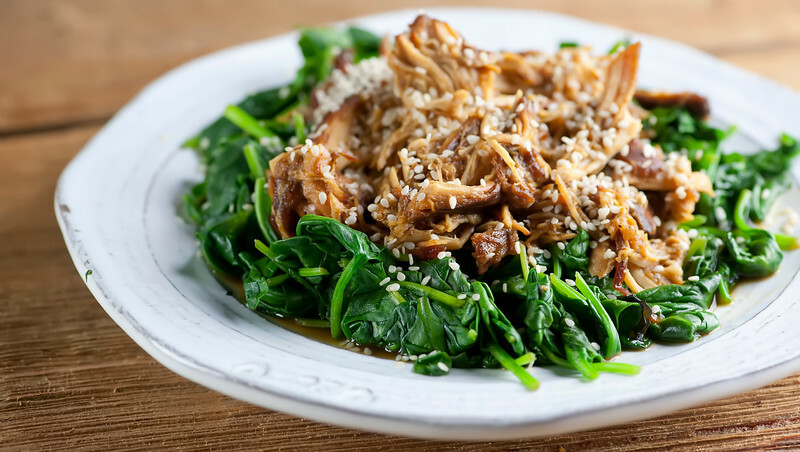 Because we want to save all our strength for the stream of dinners and parties and friends and family fun that is right ahead of us, and that means having an arsenal of easy peasy suppers for those other days…and that is where this so very simple, so very scrumptious recipe for slow cooker honey chicken comes in. So grab that slow cooker I know you have somewhere and let’s make it! Personally, I have already been up to some Christmas shenanigans. 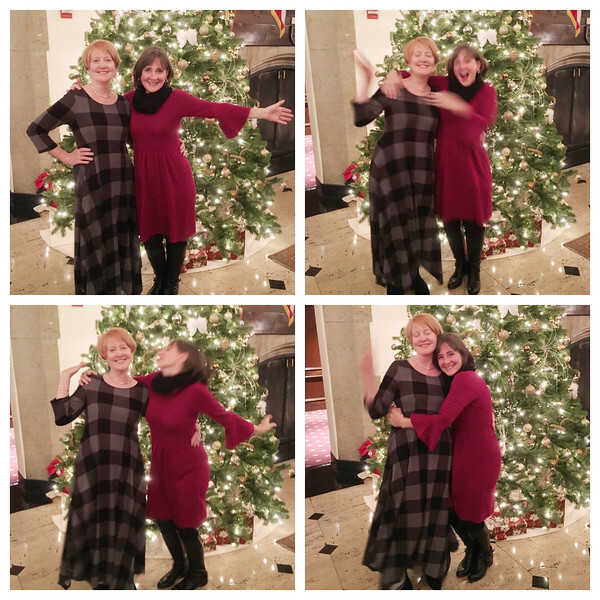 That is my adorable friend Angie, who always does everything with gusto, including getting her picture taken in front of Christmas trees. I love her more than my luggage. And pretty soon I am getting our engaged Southern daughter and my future son-in-law home for the holidays, and once THAT happens there is going to be all kinds of celebrations going on, so in between now and then I am conserving my cooking resources by doing a lot of things that require about 15 minutes or less of Actual Cooking. Such as this recipe, which lets the slow cooker do 99% of the heavy lifting. You want a few nice plump boneless chicken breasts, which you are going to pop into the slow cooker along with a sweet and tangy concoction of honey and soy sauce and various other things. Turn it on low and then go wrap presents for 8 hours or so. When the 8 hours are up, take the chicken out and shred it into bite sized pieces. In my house, this is the Southern husband’s job. He is a champion shredder. While the shredding is happening, you are going to whisk a cornstarch slurry into the slow cooker liquid to thicken it up into a glorious sauce. Now put the shredded chicken back into the cooker and toss it around with the sauce until it is nice and coated. Now you could serve this sweet and tangy chicken over polenta or pasta or rice, but I like to put it on a bed of baby spinach to get us a good helping of veggies. A sprinkle of sesame seeds and you are ready to roll. Happy holiday shenanigans, my friends! Put chicken breasts in your slow cooker. Combine sugar, honey, vinegar, garlic and soy sauce in a bowl and whisk until well-combined. Pour over chicken, turning the chicken over a few times until well-coated. Remove chicken with tongs and using two forks, shred it into bite-sized pieces. Mix cornstarch with 2 tablespoons cold water and pour into the liquid in the slow cooker. Turn the heat up to high, cover and cook for 10 more minutes. Return shredded chicken to slow cooker and toss with the sauce until well coated. Serve over cooked spinach, polenta, rice or pasta, and sprinkle each serving with sesame seeds. YES! Easy recipes are the ONLY thing I want in December! I mean for dinner. Bring on the complicated candy recipes and billions of cookies. :) This chicken looks goooood!! Love my slow cooker! Slow cooker recipes are definitely a favorite for winter! 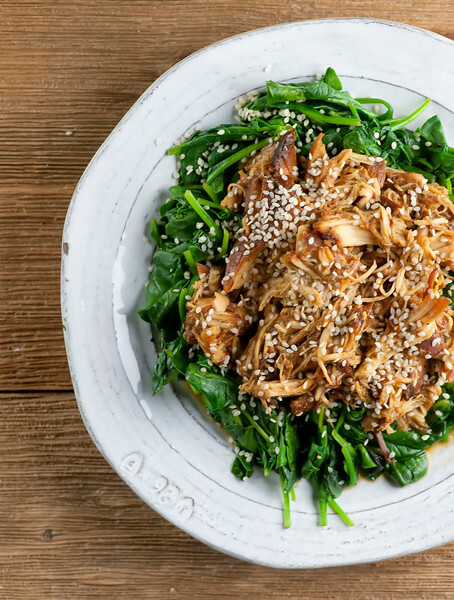 The melding of flavors over time always makes for a beautiful dish, and this honey chicken recipe sounds like the perfect dish to take advantage of that!